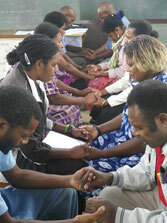 A Scripture Use Research and Ministry (SURAM) project is underway in Papua New Guinea. SURAM will help determine to what extent target language communites are using the translated Scriptures. Please pray for the S.A.L.T. teams that will be helping in this project, conducting ministry in the villages and working with local pastors and church leaders to encourage the application of the Scriptures in daily life.